Family Planning 2020 works with governments, civil society, multi-lateral organizations, donors, the private sector, and the research and development community to enable 120 million more women and girls to use contraceptives by 2020. FP2020 supports the UN Secretary-General’s movement for women’s, children’s, and adolescents’ health, Every Woman Every Child. An outcome of the 2012 London Summit on Family Planning where more than 20 governments made commitments to address the policy, financing, delivery and socio-cultural barriers to women accessing contraceptive information, services, and supplies, the movement has grown to feature more than 80 FP2020 commitment makers—including nearly 40 countries. 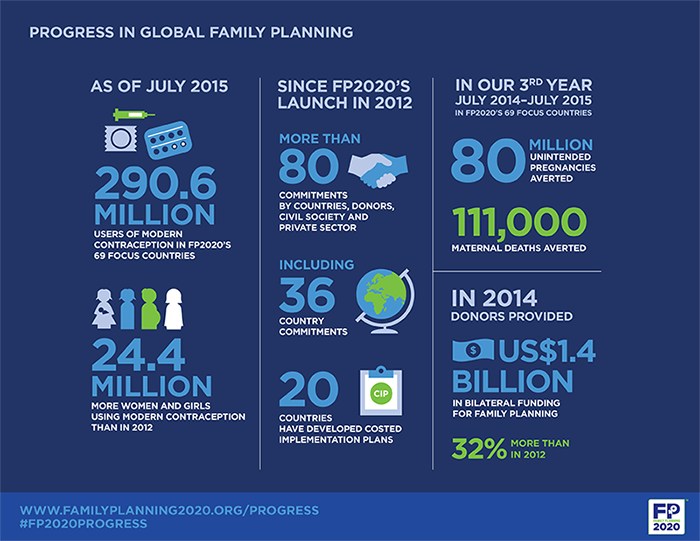 Today, because of the work of FP2020’s partners around the world, more women and girls than ever before are using modern contraception. An unprecedented 290.6 million women and girls in the world’s poorest countries are now able to decide for themselves whether and when to get pregnant, an increase of 24.4 million from the time of the London Summit. In addition, in 2014 alone, donors provided US $1.4 billion in bilateral funding for family planning—32 percent more than in 2012. Led by a 18-member Reference Group, hosted by the United Nations Foundation, and guided by a new strategy for 2016-2020, FP2020 prioritizes efforts on four crosscutting initiatives: country support; data and performance management; global advocacy, rights, and youth; and knowledge and evidence. These initiatives, and the activities that fall within each, are where FP2020 can add the most value through collaboration and mutual accountability. Across this portfolio of initiatives, FP2020’s main emphasis is on supporting and reinforcing country-level activities—building on an existing focal point network and in-country partnerships—that can dramatically increase access to high-quality family planning information, services, and supplies. and 200,000 fewer women and girls dying in pregnancy and childbirth.